Cauldron is a two-dimensional (2D) shoot 'em up/platformer computer game developed and published by British developer Palace Software (Palace). The game was released in 1985 for the ZX Spectrum, Commodore 64 and Amstrad CPC home computers. Players control a witch, who aims to become the "Witch Queen" by defeating an enemy called the "Pumpking". 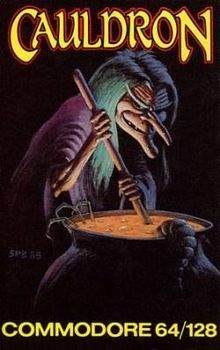 Designed by Steve Brown and Richard Leinfellner, Cauldron originated as licensed video game of the horror film Halloween. Brown eventually altered the game to use a theme based on the Halloween holiday. The mix of two genres resulted from Brown and Leinfellner wanting to make a shoot 'em up and platform game, respectively. The developers realized that there were no technical limitations preventing the genres from being combined. The game received praise from video game magazines, who focused on the graphics and two different modes of play. A common complaint was Cauldron's excessive difficulty. The following year, Palace released a direct sequel titled Cauldron II: The Pumpkin Strikes Back. Players navigate the witch protagonist through the 2D game world from a side-view perspective. Cauldron is divided into two modes of play: shooting while flying and jumping along platforms. Areas of the game world set on the surface feature the witch flying on a broom stick, while underground segments require the witch to run and jump in caverns. In the flying segments, players must search for four randomly scattered coloured keys to access underground areas that contain six ingredients. The objective is to collect the ingredients and return them to the witch's cottage to complete a spell that can defeat the Pumpking. While traversing the game world, the witch encounters Halloween-themed enemies such as pumpkins, ghosts, skulls, and bats, as well as other creatures like sharks and seagulls. A collision with an enemy results in the witch's magic meter (which is also used to fire offensive projectiles at enemies) to decrease. The character dies once the meter is depleted. After dying, the character reappears on the screen and the meter is refilled. Players are given limited opportunities for this to occur, and the game ends once the number of lives reaches zero. Cauldron began development as a game based on the 1978 film Halloween. Palace obtained the video game rights and assigned Steve Brown to the project. Unable to develop a concept he was happy with, Brown took the game in a new direction. Inspired by the Halloween holiday, he envisioned a game featuring witches and pumpkins. Stuart Hunt of Retro Gamer, however, attributed the switch to Mary Whitehouse's campaign against so-called 'video nasties' in the 1980s.